Although the majority of lateral ankle injuries or sprains resolve with conservative therapy and rehabilitation, up to 20 percent of injuries lead to prolonged disability and/or recurrent injuries that are generally termed “chronic ankle instability.” Athletic patients typically present with concern for downtime and are eager to return their desired activity. A thorough examination of the severity of injury and other associated pathology is essential. The term “chronic ankle instability” generally refers to patients with chronic lateral ankle and recurrent ankle injuries. This broad definition leads to difficulty studying the patient population. The International Ankle Consortium has tried to address, better define and study patients with chronic ankle instability by releasing guidelines for patient inclusion in research related to chronic ankle instability.3 The consortium defines an ankle sprain as an acute, traumatic injury to the ankle joint’s lateral ligament complex stemming from excessive inversion of the rearfoot or combined plantarflexion and adduction of the foot, which usually leads to some initial deficits of function and disability. The consortium also notes patients with chronic ankle instability may have a history of the previously injured ankle joint ‘‘giving way’’ and/or recurrent sprain, and/or ‘‘feelings of instability.’’ The International Ankle Consortium defines ‘‘recurrent sprain’’ as two or more sprains to the same ankle. The International Ankle Consortium also supports the following exclusion criteria: history of previous surgeries to the musculoskeletal structures, history of a fracture requiring realignment and acute injury to musculoskeletal structures of other joints of the lower extremity in the previous three months.3 A detailed history and physical examination leads to improved clinical and surgical options for patients presenting with a complaint of lateral ankle pain. The modified Brostrom procedure is a well-accepted initial surgical option for the treatment of patients diagnosed with chronic ankle instability. Traditional postoperative management includes four to six weeks of non-weightbearing. However, advances in fixation techniques and biologics have led to multiple modifications to the Brostrom procedure to reduce the non-weightbearing period and allow for more aggressive rehabilitation and a quicker return to activity. Petrera and coworkers presented a study on 49 patients who had modified Brostrom repair using two double-loaded metallic suture anchors (3.5 mm).4 In their study, patients bore weight postoperatively in a walking boot on day one and continued for six weeks. Phase 1 (three weeks after surgery). This involved full weightbearing in a walking boot, range of motion (ROM) and strengthening of the knee and hip. Patients had limited plantarflexion (0 to 20 degrees) and dorsiflexion (0 to 10 degrees) of the ankle while non-weightbearing. They were not allowed inversion or eversion. Phase 2 (three to six weeks). Patients had progressive active ROM exercises and avoided inversion. Phase 3 (six to 12 weeks). Patients increased ROM to include inversion and progressed to strengthening and proprioceptive exercises. They discontinued walking boot use. Gait training began and gradually progressed to fast-paced walking. Patients could also bike and swim. At three months after surgery, patients were allowed running, plyometric and sport-specific training. Patients could return to full sport activity after achieving full pain-free ROM, having 90 percent of ankle strength in comparison with the contralateral side and an ability to pass sport-specific tests. The authors reported on a mean follow-up time of 42 months.4 They found significant improvement in the Foot and Ankle Outcome Score from 36 (pre-op) to 75.4 (post-op) with reduced pain and symptoms, and improved function. The return to sport rate was 94 percent. After returning to sport activities, three patients in the study had residual instability after a traumatic re-injury. Miyamoto and colleagues reported on 33 patients who had reconstruction of the anterior talofibular ligament with gracilis autograft augmentation using interference screws.5 Group I consisted of 15 patients treated with four weeks of postoperative cast immobilization. Group A consisted of 18 patients who had accelerated rehabilitation without immobilization postoperatively. Researchers found the mean time to return to full athletic activity to be significantly longer in Group I (18.5 weeks) than in Group A (13.4 weeks). This study indicated that a well-defined postoperative rehabilitation program aids patients’ recovery and return to activity. Prior to surgical intervention, it is imperative to evaluate patients for any associated injuries, including peroneal tendon pathology. Although peroneal tendon dislocation is a relatively uncommon injury, it can be associated with lateral ankle sprains. The mechanism of injury is typically a forceful contraction of the peroneal complex with the foot in a dorsiflexed position. Patients present with the complaint of a snapping or popping sensation isolated to the tip of the fibula. Traditional surgical treatments include rerouting of peroneal tendons beneath the calcaneofibular ligament or retinaculum repair with and without fibular groove deepening. 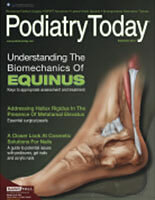 Cho and colleagues performed a retrospective study comparing 13 patients who had superior peroneal retinaculum repair with fibular groove deepening to 16 patients who received superior retinaculum repair alone.6 They found no statistically significant difference in American Orthopaedic Foot and Ankle Society (AOFAS) ankle-hindfoot scores and Visual Analogue Scale (VAS) scores between the two surgical groups. The mean return to function was three months in both groups. When assessing patients who present with peroneal tendon dislocation, it is necessary to evaluate for associated pathologies including hindfoot malalignment, ankle instability and accessory or low-lying muscle belly. Chronic lateral ankle and instability is a common and complicated complaint that requires thorough evaluation and surgical planning. Studies have shown the modified Brostrom procedure to have successful clinical and patient outcomes. Advances in surgical equipment and technique can lead to earlier weightbearing, rehabilitation and, ultimately, a quicker return to the patients’ desired activity level. It is imperative to evaluate the patient for any associated injuries or anatomic variation that may need attention during surgical intervention. Dr. Campbell is a Fellow at the University Foot and Ankle Institute in Los Angeles. 1. Waterman BR, Owens BD, Davey S, Zacchilli MA, Belmont PJ Jr. The epidemiology of ankle sprains in the United States. J Bone Joint Surg Am. 2010; 92(13):2279-2284. 3. Gribble P, Delahunt E, Bleakley C, Caulfield B, Docherty CL, Fong DT, Fourchet F, Hertel J, Hiller CE, Kaminski TW, McKeon PO, Refshauge KM, Wees P, Vicenzino W, Wikstrom EA. Selection criteria for patients with chronic ankle instability in controlled research: a position statement of the International Ankle Consortium. J Ath Train. 2014;49(1):121–127. 4. Petrera M, Dwyer T, Theodoropoulos JS, Ogilvie-Harris DJ. Short- to medium-term outcomes after a modified Brostrom repair for lateral ankle instability with immediate postoperative weightbearing. Am J Sports Med. 2014;42(7):1542. 5. Miyamoto W, Takao M, Yamada K, Matsushita T. Accelerated versus traditional rehabilitation after anterior talofibular ligament reconstruction for chronic lateral instability of the ankle in athletes. Am J Sports Med. 2014;42(7):1441. 6. Cho J, Kim JY, Song DG and Lee WC. Comparison of outcome after retinaculum repair with and without fibular groove deepening for recurrent dislocation of the peroneal tendons.